Friday again, glorious Friday. I don't know about you guys but the last few weeks before the end of school are always crazy around our house. I feel like I've been sewing like a mad woman the past few weeks and loving every minute of it. I posted an in-progress shot of my strips cut for these quilts on IG, with the info that if you have 40 half yards of fabric you have enough to make 7 jelly roll quilts. I had a half yard bundle of Denyse Schmidt's Shelburne Falls along with the coordinating solids bundle that Pink Chalk Fabrics put together just burning a hole in my stash. As this is the year of using that stash, I decided that since I needed several family gifts this month as well as a teacher gift I'd just knock 'em out assembly line style with jelly roll quilts (you know I love them). It turned out that my bundle of solids was really 2 FQ sets (not half yards) so I just cut two strips for each quilt from the long side (22") of the FQ. After joining your forty 40" strips you being by cutting an 18" portion off one strip so I just left one solid strip out of my set of strips. If you're keeping track that was 30 print strips (41"x2.5") and 19 solid strips (21"x2.5") - lengths are approximate. I realized after assembling them that I had more inches than necessary but it just resulted in slightly wider quilts than the original pattern. I love how the colors and prints play in these! Blair over as Wisecraft has a great tutorial here if you haven't made one before - she miters her strips together and I just sew 'em together, both ways end up looking good (straight edges are just a bit faster). I used a different color flannel and coordinating biding for each. All the flannel came from JoAnn's and I've been really pleased with the weight and quality of what I've found there lately. One was gifted today, two coming up this weekend and I have one still to finish. And I'm not a sewing superwoman. I don't want you to think anything other than these are easy quilts to make and if you can find a little time every day to work on them they'll come together faster than you expect. If I can do it, you can too and I can't recommend these highly enough as great gift quilts. So there you have it and now I am really very ready for a nap. Under a quilt, with the A/C on ;-) If you're in the US, I hope you have a lovely Memorial Day weekend! See you back here next week. Can you even stand it?! Another quilt for the Blogger's Quilt Festival! I'm on fire getting stuff done around here - which won't last but I'm enjoying it while it does. This is one of my favorite color combinations ever, put together with HST's. I used Christina's size chart which is posted here at Whip-Up and chose the Kona colors all based on a print I loved that I used both as inspiration and for the backing. I used the 8 1/2" squares for this method to end up with 5" finished squares. I'm pretty sure this whole project and the way I quilted it was inspired by a triangle quilt that Debbie at A Quilter's Table made a long time ago (last year maybe?). I just started the quilting with one kind of zig-zaggy line through the quilt along the HST's and then echoed it and started in new spots when I needed to. It's 25"x35" (120") total and I couldn't love it more. Wouldn't this make a great prop for a cool baby photo? The colors just pop. The inspiration print! This was such a quick sew - I can see more (and maybe larger ones) in my future. Thanks for stopping by! 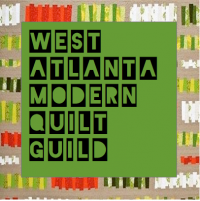 Entering in and linking up with the Blogger's Quilt Festival. I am so excited to *finally* be entering a quilt in the Blogger's Quilt Festival - it's fun to look and vote but it's even more fun to participate :-) This quilt came from a challenge started by our local modern quilt guild - "everyday inspiration". The goal was to keep your eyes open for things that inspired you throughout your day that could be turned into a quilt. The idea of finding/making art from common things really inspired me, I have probably a dozen more ideas waiting to be made. When this catalog came in the mail I knew immediately that it would make a gorgeous quilt. I used Victoria Findlay Wolfe's "made fabric" technique to make the center fabrics and Anna Maria Horner's super circle tutorial to applique the circle to my background fabrics. I love the interest and contrast created with the made fabrics - they were so quick and fun to put together I could have just kept on making fabric for days! This is a fantastic way to use scraps that are irregular shapes and sizes and turn them into larger, more usable fabric. Finally I quilted it with straight line quilting - varying the widths for interest. It measures 27"x24" (102" around total). I promptly washed it and I love the crinkles and softness that resulted - also since I quilted over the appliques they were completely fine in the wash (not that I was worried ;-). Linking up with the Blogger's Quilt Festival! Happy Friday! It has been a long week around here, and thankfully ridiculously productive. I don't know why it seems like when it rains it pours but this month is flooded with projects I need to get finished. I was thrilled to be able to complete a few fun projects on time this week and this is the last one - my Pretty Kitties mini quilt for the Triangle Quilt-a-Long hosted by The Sassy Quilter. This was my first foray into triangles and now I'm definitely curious about trying more! I really appreciated the kick that this QAL gave me to jump in and get started. So I used 60 degree triangles cut to 4.25" tall - can you tell who inspired me? If you know Paisley Sprouts (she's paisleysprouts on IG) you'll probably recognize my attempt at recreating her gorgeous triangles - she sells the most wonderful pouches and pillow covers. She also makes her perfect points and wonderful color combinations look easy. They aren't. Fun fact that I learned about triangles (thanks to my math whiz husband) equilateral triangles are equal on all three sides but they are taller than they are wide. Did you catch that? NOT really equal. So I learned that 60 degree triangles won't work if you're trying to end up with a square. Good to know and the reason my pillow cover ended up a mini quilt. Live and learn. I'm still happy with all the cuteness going on here and thanks to all the great tutorials Paula posted on sewing triangles I feel way more competent to try some more. I'm linking up with The Sassy Quilter for the Triangle QAL finishes and Crazy Mom Quilts for Finish It Up Friday. I'm really proud of how much I finished this week - kind of rare and definitely awesome. Thanks for stopping by, hope the weekend treats you well.